In the absence of Avery Bradley entering Game 1 of this series between the Celtics and Miami Heat, we worried mostly about the wounded Ray Allen, about his inability to match up with Miami Heat guard Dwyane Wade. Maybe it's time to move Paul Pierce to the top of the list. Quite simply, he doesn't look like he can even come close to handling LeBron James anymore on either end of the court. Even if you conceded the Pierce-James matchup entering the NBA Eastern Conference finals - and you should have - what happened at American Airlines Arena on Monday night should have you reevaluating exactly where the Celtics are positioned in what could be this era's equivalent to Custer's Last Stand. James outscored Pierce (32-12) and outrebounded him (13-2), all while making nine trips to the free throw line. In James' case, that figure was best in the game. In Pierce's case, that number was the worst. So why are we picking on Pierce? Because what has happened on Monday night merely continued a rather disturbing trend. Fact: in the last six postseason games between these teams, the Heat are 5-1, including a perfect 4-0 on their home court. Pierce played well in the one Celtics victory during that span, that coming in Game 3 of last year's second-round series. Of course, that contest also came following three days off and did little to derail James or the Heat, who promptly won the next two games to close out the series. Starting on Monday and working our way backwards, James has now scored 32, 33 and 35 points in the last three playoff games against the Celtics - all Miami wins - while ripping down 31 rebounds and shooting 36 of 70 from the field (.514), including 7 of 16 (.438) from 3-point distance. He has attempted 27 free throws. Before anyone suggests that these numbers are at all skewed because they either represent a small sample or because they discount the Boston victory, you're missing the point. In the postseason, every game matters. And so long as James can outplay Pierce by a landslide in five of every six games, Miami will happily throw one game away. We all know the reality here. Pierce is 34 and will turn 35 in October. James is 27. But for all that has been said and written about the Celtics and Heat in recent years, decidedly little attention has been paid to this matchup. Here in Boston, we have spent considerable time talking about the perceived advantages the Celtics have in Kevin Garnett and Rajon Rondo. Entering this particular series, we all acknowledged that the absence of Bradley could create a serious issue for the Celtics with regard to Wade. 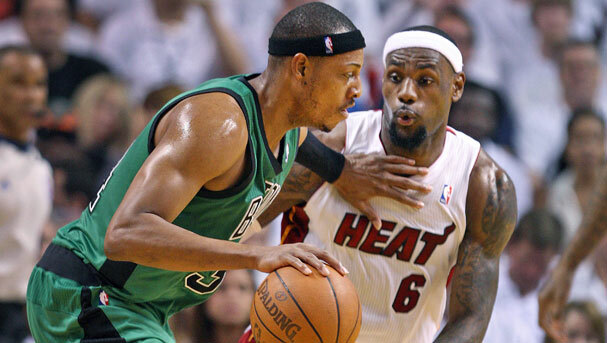 We knew, too, that James is a better player than Pierce. But if Pierce does not do at least a little more to make James' life difficult, the Heat will wipe the floor with the Celtics again and drain any potential drama from this series before anyone knows what happened. Four years ago, as we all know, Pierce and James engaged in one of the great Game 7 duels in league history during the second round of the Eastern Conference playoffs. While James scored 45 points in an eventual 97-92 Celtics victory, Pierce answered with 41 and finished as a plus-10, the best number of any starter in the game. In many ways, James was every bit the force then that he is now, but Pierce was equipped to match him nearly blow for blow. But now? Only heaven knows if Pierce has it in him to even remotely slow down LeBron - or whether the Celtics have any other options at their disposal. Allen, too, looked terribly overmatched on Monday night, and one cannot help but wonder whether Celtics coach Doc Rivers must consider some matchup changes before the teams play Game 2 on Wednesday night. If Paul Pierce is incapable of doing a better job against LeBron James than he did on Monday night, after all, the Celtics don't stand a chance.